1. Place all ingredients in the bowl of an electric mixer fitted with a dough hook. Mix on low speed for 1 min. 2. Increase to medium speed for 4 min. 3. 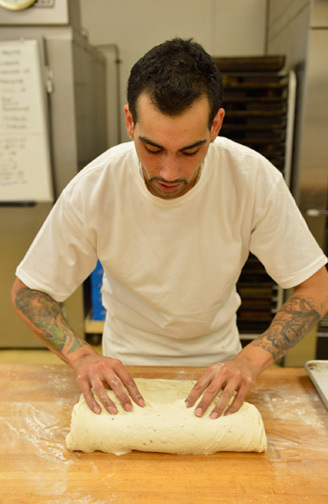 On lightly floured surface form dough into a ball, place in greased sealable container. 4. Refrigerate for min 12 hrs (max 36 hrs) before use. 1. Oil a large parchment-covered baking sheet from corner to corner with 2 Tbsp olive oil. 2. 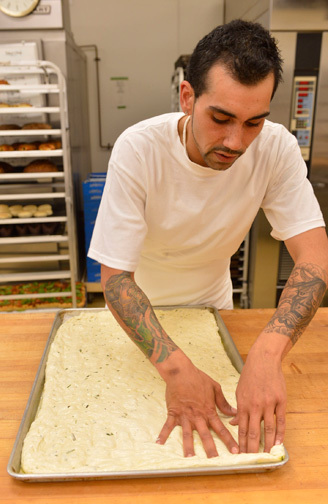 On lightly floured surface flatten dough into square with hands. 3. Fold the top third over and the bottom third up like a business letter. 4. Place focaccia dough in centre of pan lengthwise. 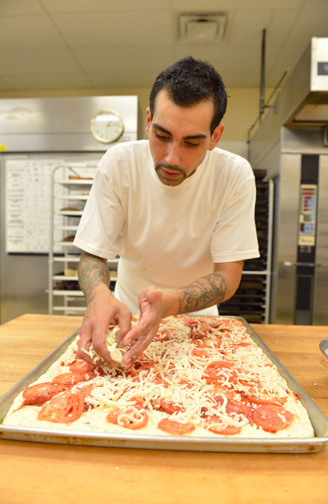 With hands lightly press dough into rectangle filling about ¼ of pan. Cover and let rest for 45 min to 1 hr. 5. 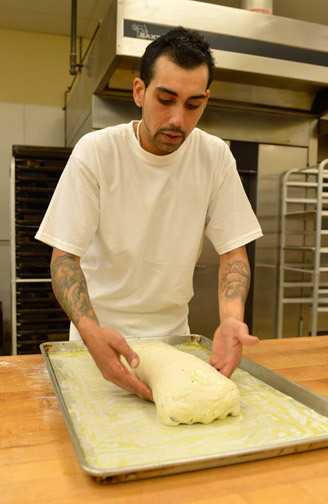 Drizzle dough with 2 Tbsp olive oil, use fingers to gently spread dough out to fill 2/3 of pan. Cover and let rise for 45 min. 6. Again gently use fingers to push dough out evenly to fill pan. Cover for 45 min. 7. 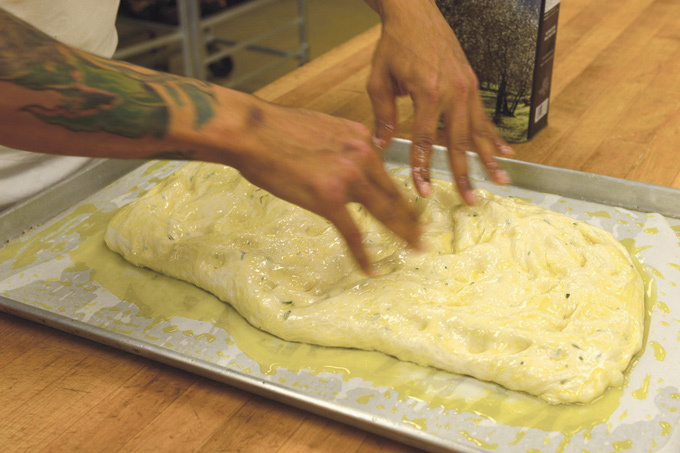 Use fingers to ‘dimple’ focaccia. Cover for 30 min. 8. Preheat oven to 450°F. 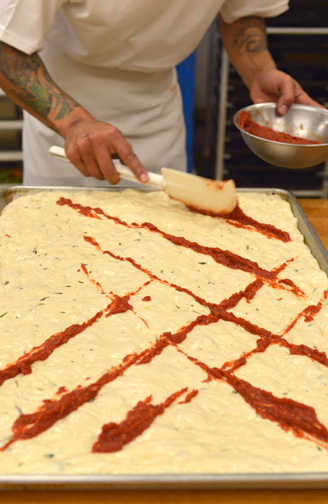 Spread pizza sauce evenly over surface of focaccia. 9. Evenly place tomato slices, then cheese and garlic over the entire surface. Drizzle with remaining 2 Tbsp olive oil. 10. Bake for 15 min until fully cooked. Check bottom of dough for browning. 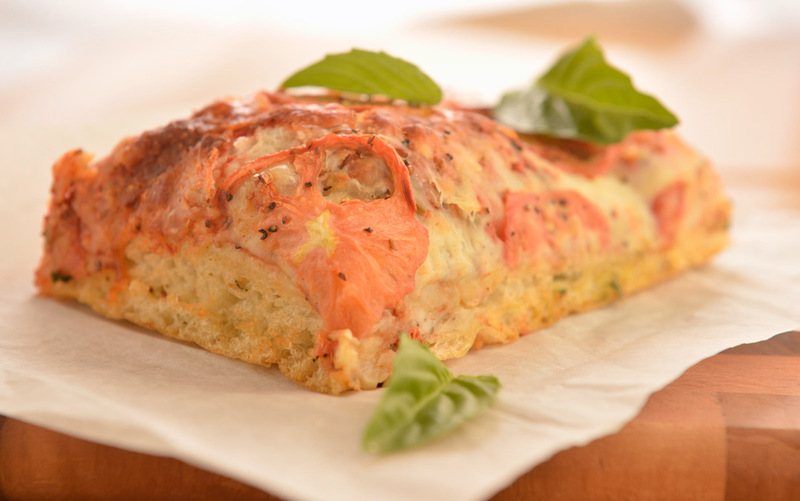 Allow to cool slightly, finish with an even layer of basil.